Yep. 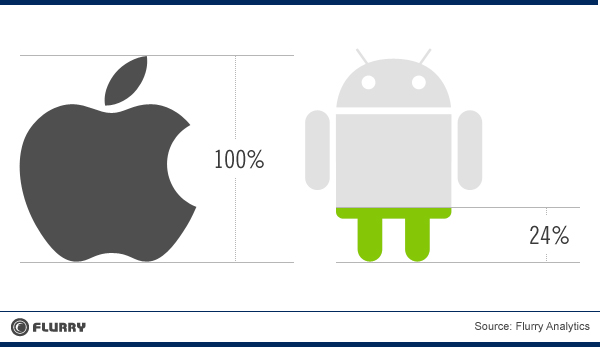 Developers Are Still Building For Apple’s iOS Over Android By A Factor Of 2-to-1. MG Siegler asked this question yesterday. Where are those awesome Android-exclusive apps that Google chairman Eric Schmidt said were coming? 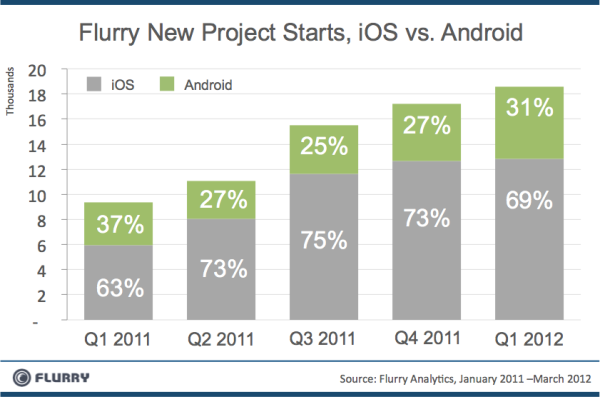 Not here yet, if you look at Flurry’s data. The company, which has its mobile analytics service in 185,000 apps and 100 million unique devices, says that developers are still building for iOS over Android by a ratio of 2:1. This ratio is pretty much unchanged from a quarter ago, although Apple always gets a huge bump up during the holiday quarter. Yes, the holiday quarter is really that lucrative with 250 million downloads on last year’s Christmas Day alone. The main reasons for iOS’ continued edge are that monetization is just that much easier plus there are fewer fragmentation issues. “Android delivers less gain and more pain than iOS, which we believe is the key reason 7 out of every 10 apps built in the new economy are for iOS versus Android,” wrote the company’s vice president of marketing Peter Farago in a post. Fragmentation is still a beast. Unlike iOS where you might have to deal with the 4S, the 4, the 3G and the 3GS (or maybe a half-dozen models), Android developers generally need to support dozens of devices. Or if you want to go the extra mile, hundreds! 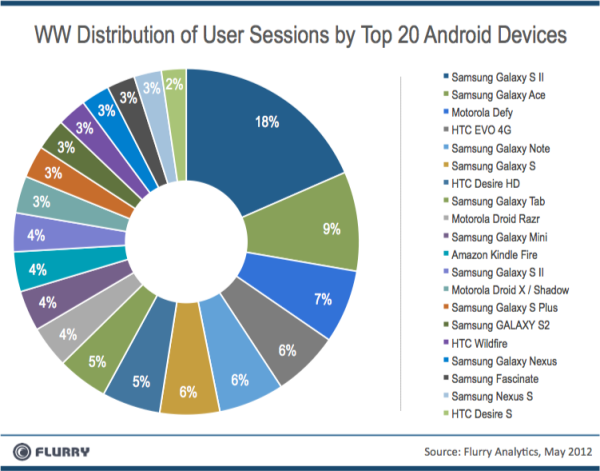 Beyond the Samsung Galaxy S II and the Samsung Galaxy Ace, no other phone holds more than a seven percent market share of global user sessions, according to Flurry. 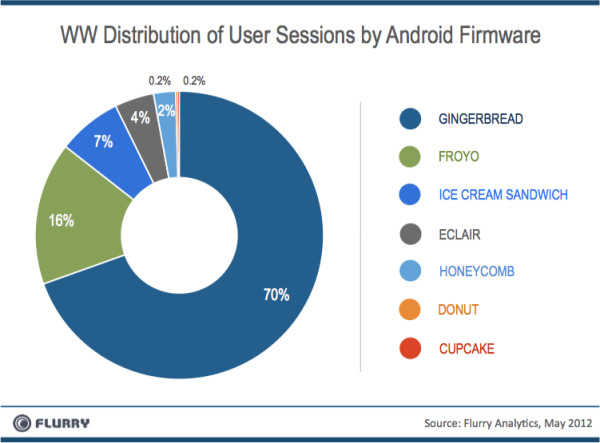 Versioning is always an issue with the latest Ice Cream Sandwich edition of Android being on just 7 percent of phones. The leading version is still Gingerbread, which is well over a year old. “This means the that majority of consumers are running on an Android operating system that is three to four iterations old,” Farago writes. Then there’s monetization. For every dollar that a developer earns on iOS, they can expect to earn about 24 cents on Android. Flurry published this chart awhile ago but apparently the ratio hasn’t changed that much. The reasons for this gap are also very well-known. Basically, Google doesn’t have as mature a payments product as Apple does and it has a fraction of the customer database that Apple does. Apple had more than a decade to build out a wealth of credit card information on more than 250 million users through iTunes. Because the original version of Google Checkout wasn’t wildly successful, the company basically had to start from near square one in building payments infrastructure for Android. But they’re working on it! They recently added features like the ability to do subscription billing.